Illustrator Tina Kugler's Sputnikfest 2013 poster celebrates the fall of the former Soviet Union's Sputnik IV in 1962. On Sept. 6, 1962, a hefty chunk of the Soviet Union's Sputnik IV satellite dropped into the middle of the street on the corner of North 8th and Park streets in Manitowoc, Wis.
To this day, that Soviet space encounter with an American city is celebrated at Manitowoc's Sputnikfest, an annual sci-fi and art festival that its organizers call "wacky tacky." Organizers of this year's event, held Sept. 7, tossed out the welcome mat to all onlookers and out-of-towners by asking, "Sputnik landed here...Why don't you?" The 5-ton Sputnik IV flew into orbit in mid-May 1960. According to Soviet officials at the time, the spacecraft carried out testing of Russian life-support equipment to be used later in the country's piloted Vostok spaceship. But ground controllers botched the craft's re-entry, accidentally shoving Sputnik IV into a higher orbit. The satellite went around and around in a space-age version of Russian roulette, finally turning into "Kerplunknik" and plummeting to Earth nearly 28 months later. One disk-shaped object weighing nearly 21 lbs. (9.5 kilograms) wound up in the middle of a Manitowoc street. Early risers that morning reported seeing as many as 24 pieces of Sputnik IV hurtling through the sky. Some perceived a "thunderlike noise" associated with the falling debris. The largest piece of space junk, seen leading the formation of fragments, is thought to have fallen into Lake Michigan. Today, visitors to Manitowoc, Wis., can visit the site where a fragment of Sputnik IV landed in 1962, noted by a metal ring in the middle of one of the city's busiest streets. The hunk of Sputnik IV that fell on the Manitowoc street was heard by a woman near the crash spot. Two policemen patrolling the area at 5:30 a.m. noticed the fragment, but thought it was discarded cardboard. They later stopped and found the object to be metallic, embedded in asphalt and too hot to handle. Analysis of the recovered debris was performed later by a number of organizations, such as the Smithsonian Astrophysical Observatory, the Massachusetts Institute of Technology, Brookhaven National Laboratory, Los Alamos National Laboratory, the Air Force Cambridge Research Laboratories, and the Carnegie Institute of Technology chemistry department. Back in those early "space race" days, any insight into what the Soviet Union was up to in satellite-making was considered an intelligence plus. An initial effort to deliver the remains of Sputnik IV to the Soviet Union was rebuffed by Soviet officialdom, but the Soviets did finally accept the fragment. On Jan. 5, 1963, representatives of the Soviet Embassy in Washington, D.C., formally took back what was left of their 5-ton spacecraft. A 1972 U.S. Senate report on liability from re-entering space objects lists the Wisconsin incident as event No. 5 in a Space Object Fragment Summary, said Nicholas Johnson, chief scientist of the NASA Orbital Debris Program Office at the Johnson Space Center in Houston. A replica of the recovered Sputnik IV chunk of space junk is on display at a museum in Manitowoc, WI. 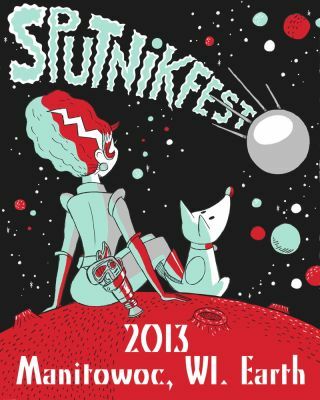 In the meantime, Sputnikfest is the premier experience that spotlights the sky fall of Sputnik IV. "The event was, once again, a hit with people locally and nationally," said Greg Vadney, executive director of the Rahr-West Art Museum. "We had folks come in from as far away as Florida, Texas and Arizona for this year's Sputnikfest." Vadney said that, despite the hot weather (for Wisconsin), people turned out to have fun and experience Sputnikfest. "Sputnikfest is an event where you leave your self-consciousness at the gate,” he told SPACE.com. Sputnikfest is an excuse to have fun in the name of space history, Vadney said. "When Sputnikfest was devised six years ago, the thinking was: 'Hey, the fact that a Soviet satellite crashed mere steps from our front door is just wacky. Let's make a festival in that vein — we don't take it too seriously, and we enjoy this crazy era, the 1960s, in space history and in social history.' We keep the event simple and silly and fun," Vadney said. Two Manitowoc police officers patrolling the streets in the early morning found a chunk of space-age history in the form of a fragment from the Soviet Union's Sputnik IV. "It was a really fun event" Manitowoc resident Tina Prigge told SPACE.com. "The Masquers community theater, Wisconsin's oldest continually running theater group, scripted a hilarious reenactment of what occurred back on that fateful day, from the Russian scientists celebrating too early with vodka and pushing the wrong button…to the Manitowoc gumshoes who discovered the fallen debris." Prigge said this year's festivities included "Sputnik: The Musical," as well as "Alien Drop," which involves tiny aliens with numbers on them that correspond to raffle tickets. The Manitowoc Fire Department uses its ladder truck to stretch high above the brass ring that denotes where a Sputnik IV leftover dinged the same street 51 years earlier. The aliens are dropped from that height, and the alien that lands within the ring, or closest to the ring, wins the cash. "Oh, and the unique, out-of-this-world costumes that some people wear to the event are so clever," Prigge said. "And there is no shortage of tin foil!"